Responding to the Public Company Accounting Oversight Board’s Concept Release on Auditor Independence and Audit Firm Rotation No. 2011-006, NASBA Chair Mark P. Harris and President David A. Costello in their December 14, 2011 letter urged the PCAOB to focus on other measures to address professional skepticism rather than requiring audit firm rotation after a fixed period of years. “The PCAOB’s inspection process has resulted in improvements in internal controls and audit quality. 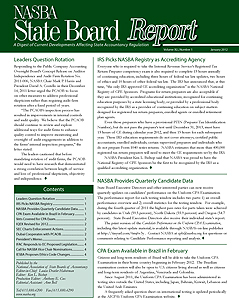 We believe that the PCAOB should continue to review and explore additional ways for audit firms to enhance quality control to improve monitoring and oversight of audit engagements in addition to the firms’ internal inspection programs,” the letter stated. The leaders cautioned that before mandating rotation of audit firms, the PCAOB would need to have research that demonstrated a strong correlation between length of service and loss of professional skepticism, objectivity and independence.